Movie Review: “Spy” is a bombastic action comedy, written and directed by Paul Feig (“Bridesmaids”), that tells the ventures of the CIA agent, Susan Cooper (Melissa McCarthy), a hilarious feminine version of James Bond. Cooper is an ‘invisible’ deskbound analyst teaming with the ‘real’ spy, Bradley Fine (Jude Law), whom she admires so much. During a risky mission in Bulgaria, where a suitcase nuke bomb has to be found, Fine accidentally shoots his target, Tihomir, but is killed afterwards when he invades the house of Tihomir’s daughter, Rayna (Rose Byrne), the one who might lead him to track the suitcase’s whereabouts. Rayna partners in crime with her unpredictable thug boyfriend, De Luca (Bobby Cannavale), who becomes the first real target for Cooper, recently authorised to operate as a field agent. With the super-cool co-worker, Nancy (Miranda Hart), assuming her former place, and with the clumsy un-help of another agent, Rick Ford (Jason Statham), the big ‘Super-Coop’ reveals a lot of intelligence and agility on her moves and a ferocious determination when comes to knock out the foes. Somehow, she and Rayna become friends and the mission proceeds to Paris and Budapest, where a couple of plot twists and a few well-choreographed physical confronts entertain us, along with the sharp dialogues, so relished by the crowd. Ms. McCarthy does the rest, feeling like a fish under water in a role that was perfectly designed for her half-sweet half-rude acting style. The film does justice to its title, with the appearance of tricky double agents, weird informants, weapons dealers, and a bunch of situations that would leave 007 embarrassed but with a big grin on his face. 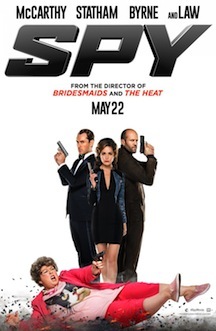 Occasionally fatuous, “Spy” is not really a novelty in its methodologies, however, far from being a super movie, is the summer-fun film that everyone is looking for, gathering a sense of adventure, jocular speech lines, and a fueled performance by its main actress.